All Pixpa website plans have additional cloud storage space for original files. Client galleries that are a platform to share, proof, sell and deliver images online. Here are all the things that you can do with the Client galleries feature. Files section where you can upload your PDFs or other documents (for example – your resume or any tear sheets) to make available for download only in your Pixpa site. Know more. Digital products where you can upload your digital assets (Sound, Images, audio, zip files etc) to sell via Pixpa store. Know more. If you need more space, you can add space any time by adding the client-galleries add-on to your website plan. You will have the option to choose from 10GB up to 10TB. Click here to see all add-ons. You can review the available space from subscription page in studio. From here you can either upgrade your site plan or apply an add-on to current site plan. Know more. You can also subscribe stand-alone Client Galleries-Only Plans, that are based on the the provisioned cloud storage for managing client galleries. Client Galleries-Only Plans give you the ability to create private or public client albums and galleries. You can sell your images as prints/products or downloads and deliver your files digitally to clients. Client Galleries-Only Plans do not include the ability to create a portfolio website. 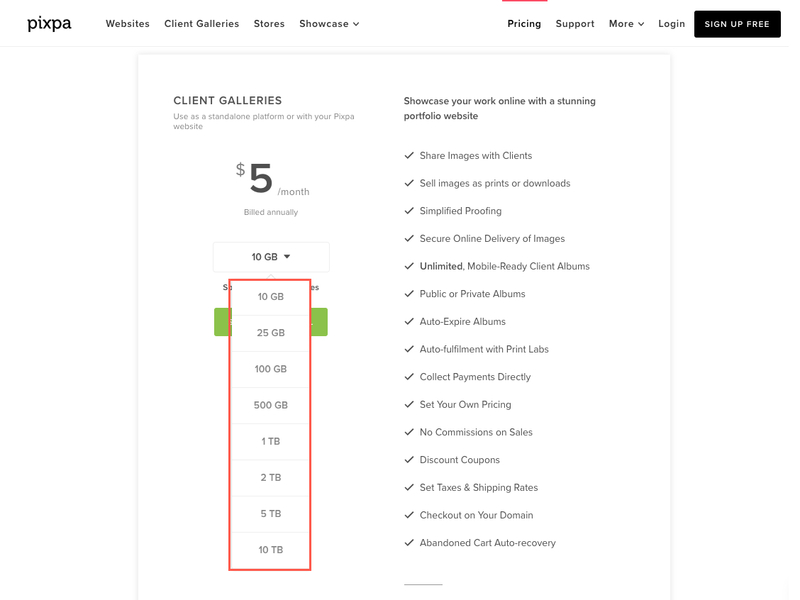 If you are looking to create a portfolio website, see Pixpa’s regular pricing plans.